Buy one $20 gift card and get the second one FREE!!! "Find Your Grind" at South Shore Grill in Honolulu! 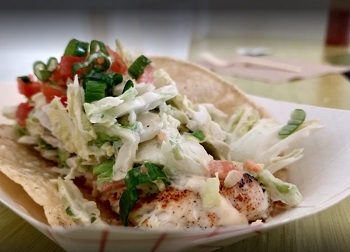 South Shore Grill is a family-owned restaurant, known for serving you the best fish tacos, plate lunches, and sandwiches on the island. 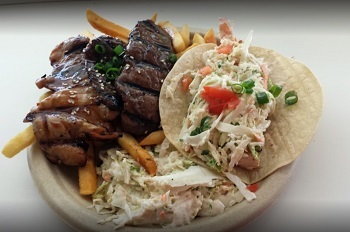 We’re your local style spot for ono (delicious) grinds on the south shore, just outside of Waikiki. 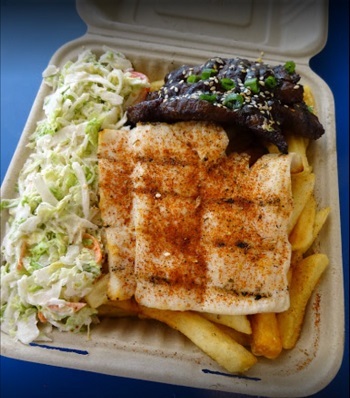 Located two blocks up from the Waikiki Shell and Kapiolani Park, or 4 blocks down from Diamond Head crater.South Shore Grill features the best fish tacos, BBQ chicken, and mahi-mahi or salmon plate lunches. Burritos, sandwiches, salads, garlic fries, a full size burger and homemade deserts round out our diverse menu. We’re open for lunch and dinner till 9pm every day of the week! Great place to stop after the beach, hiking the crater, or an afternoon at the park. Come and "Find your Grind"! Cannot be used with any other deals or coupons. Not valid on "Taco Tuesday Tacos". Gratuity not included, No cash value. One certificate per visit must be used in whole, no cash back.